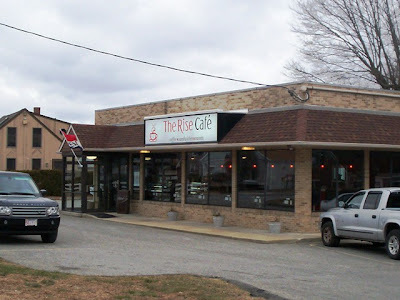 I read an article about The Rise Cafe in our local newspaper The Herald News, but what really caught my attention was the picture of their cupcakes - and the names: cotton candy, Oreo, peanut butter cup, oh my! Also, there was mention of many other goodies, so Laura and I had to see for ourselves. We stopped in on a Saturday afternoon, after having feasted at the nearby China Lake restaurant (a new personal favorite). The cafe is upscale and adorable inside, but guess what? We forgot our camera. That might have been a good thing because I doubt we could have gotten any pictures. The place was busy and there was this girl who kept hovering around the cupcake case and blocking my view, all the while telling me to "go ahead and shop around me." Well, she was still deciding on her single cupcake when we were already done and getting in the car. Anyway, that day we got six cupcakes that were delicious and beautifully decorated with frosting swirled high. We noticed lots of other very elegant treats and vowed to come back with camera in hand. Cut to one week later at 3:05 p.m. We returned to The Rise Cafe with the camera hidden in Laura's pocket. This time the place was quiet, except for gentlemen lingering over pastries and coffee at the counter. The place is small, but very pretty and clean. 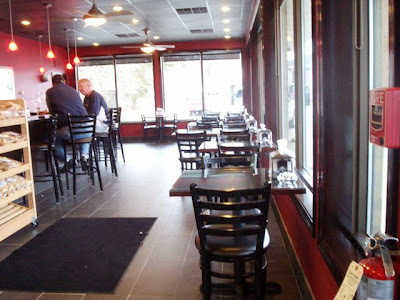 Besides the counter and stools, you can eat your goodies at a few scattered tables by the windows, or get them to go like we did. They do have a drive-thru window, but it wasn't open (probably because it is too cold). It was tough deciding amongst the pastries, but we finally chose two very large cookies (chocolate chip and M&M's), a walnut brownie, two coconut flans made with cheese, a slice of pineapple coconut cake, a chocolate torte, an eclair, and a fudge-covered whoopie pie. It came to $17.31 - a little expensive, but these were not your ordinary bakery items. 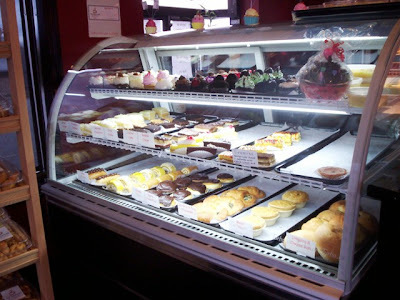 Everything was very tasty, but take my advice - because these pastries are in a refrigerated case, you should let them come up to room temperature before eating them. Their full flavor doesn't come out if they are cold, but Laura and I have trouble waiting. Also, as an added bonus for people in this area, they have fresh malasadas (Portuguese fried dough) every Saturday and Sunday. 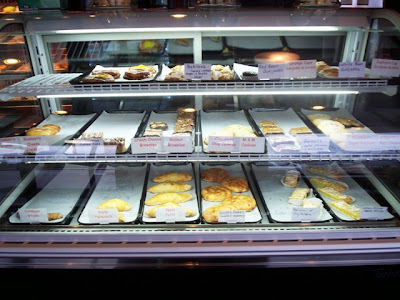 Be sure to stop in and pick some up for a nice breakfast treat. 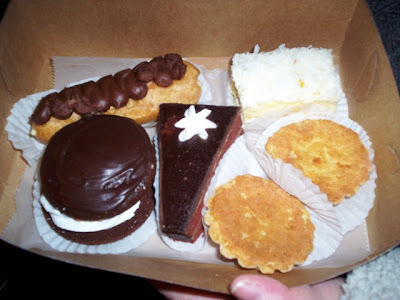 Pictured: Eclair, chocolate torte, flan, pineapple coconut cake, and whoopie pie. 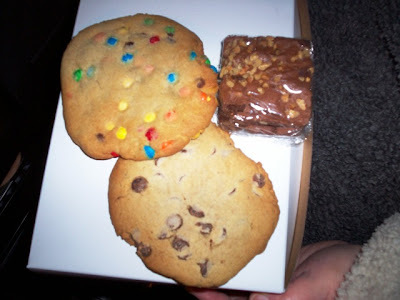 Pictured: Chocolate chip and M&M cookies and walnut brownie. 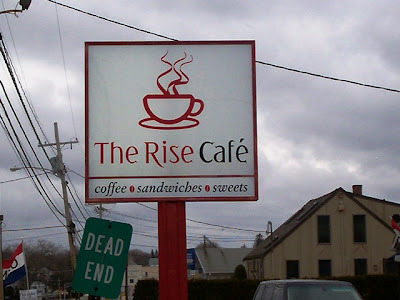 The Rise Cafe is open from 5:30 a.m. to 6 p.m. Monday through Friday, 6:30 a.m. to 5 p.m. on Saturday, and 6:30 a.m. to 2 p.m. on Sunday.